I've written about circular polarizers before, but I wanted to revisit them one more time. Reducing reflections and glare from water, glass, etc. Note how the polarizer allows you to see into the water a bit more. In this case it is undesirable as you can see the muddiness more, but that's what it helps you do. I used a polarizer in Kamloops to photograph the salmon run. 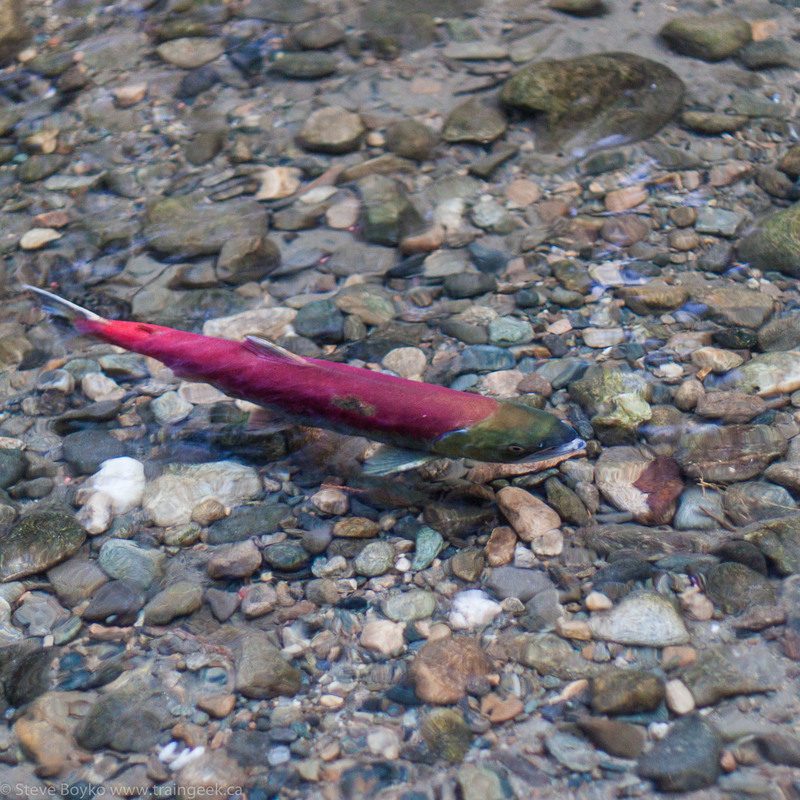 It made a dramatic difference in the ability to see the fish under the surface of the water. That shot was not possible without a polarizer. I used a polarizer yesterday at Elkhorn, MB to perform #2, darkening the skies. I didn't edit the Elkhorn photos at all except to adjust the crop a tiny bit to get the same composition, and I applied the same lens correction to both in Lightroom. You can see how the polarizer brought a lot more interest to the sky. The sky is darker and the clouds are better defined. I like dark blue skies so I like to use a circular polarizer... when I remember it. The only downside to using a polarizer is that it reduces your exposure by a couple of stops, so you need a bright day to avoid reducing the light so much that you have to use a high ISO or slow shutter speed. A circular polarizer is pretty much the only filter that you can't totally simulate in Photoshop. 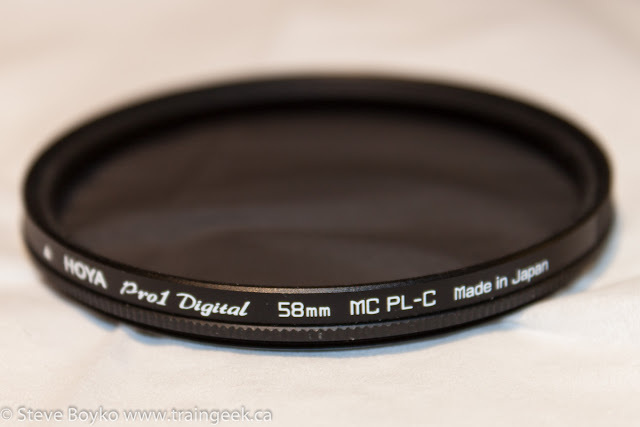 This video shows you how circular polarizers are used. Basically you screw it on the end of your lens, and when you are ready to shoot, you turn the polarizer until you get the amount of polarization that you want. To recap, a circular polarizer is used to cut down glare and reflections, and to darken skies. It's a useful item to carry around with you, especially when shooting outside or when photographing water. Enjoy! I have several rules for engaging links to my Blog. First, they are authentic, with demonstrable content. Second, they offer vibrant information that promotes history of railroads. Third, they off dynamic current information about rail operations. Links to a Blog are a drag on my web site. Whenever you bring up my Blog, a signal is sent out to the reference Blogs I have listed, seeking update information. In other words, linking to other Blogs affect the performance of my Blog. Since my Links reflect my standards for a Blog, I winnow out garbage. Garbage includes using a Blog for promoting a product or service. This polarizer is the second time you’ve violated my rules. While I am impressed that you are an avid rail fan, I will not condone commercial promotions on my Blog. BTW, I've had 1,096,628 page views on my "Not So Old" Blog. Hi Robert, feel free to do whatever you want on your blog. It's yours. I provided links to circular polarizers in case people want to buy one. They don't have to. 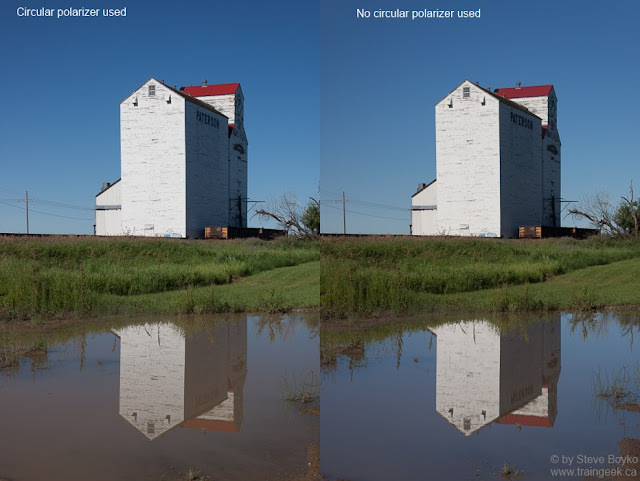 I didn't write the post just to try to sell a polarizer; I wrote it because I thought people would be interested in the effect that circular polarizers provide. I'm sorry you've dropped my blog from your blogroll and that you consider it garbage. You are entitled to your own opinion and I'll defend your right to have an opinion, even though I disagree with it. I'll continue to link to yours because I think my readers may like it. I don't think you understand how linking affects your blog but that's OK.
BTW congratulations on your continued success. A million page views is impressive. DaveM, I often forget too! Mine takes somewhere between 1 and 2 stops of light which is not great, but you can sacrifice that when it is a bright sunny day, or when using a tripod. Old pro John Sharpe gave me a bag of filters he had lying around that happened to be the right size for my lens. The polarizer, which I use now and then, had a receipt from 1980 in the case ($99.95!). Looks like he never used it. This one drops the exposure by a single stop. I can believe that price, Chris! The good polarizers are pretty darn expensive, although as you point out they drop the exposure by less than the inexpensive ones. Thanks for the polarizer reminder! I put mine in my bag and forgot about it. Another advantage the polarizer has is that when it's on it protects the lens. It is a lot cheaper to replace a polarizer than it is to get a scratched lens repaired. You can remove Roberts comments too. All he is doing is advertizing in your space.